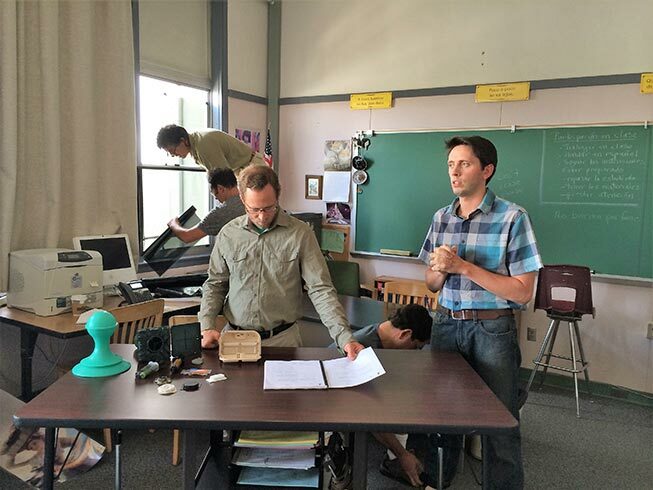 Preparing for a scene in a classroom. 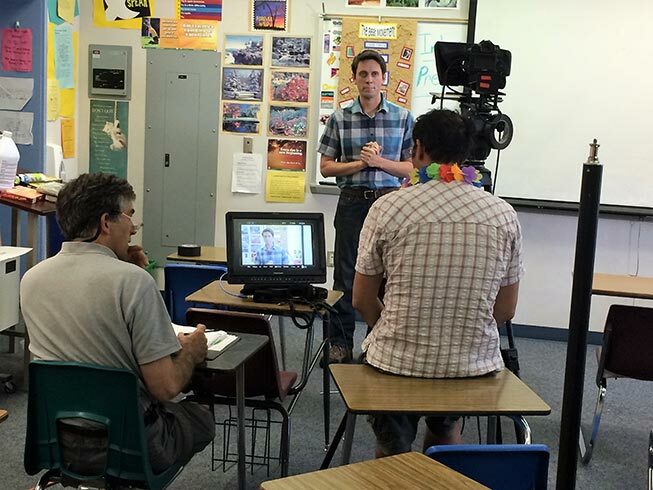 We just finished shooting a large instructional video series on the subject of Integrated Pest Management in Schools for the California Department of Pesticide Regulation. The video production is a series of ten episodes, each focusing on a different pest problem in the school environment: cockroaches in the classroom, mice and rats in the kitchen, gophers in the athletic field, etc. To hold the audience’s attention the client asked for a humorous video and we were more than happy to comply. Three cameras ready to go for an interview. 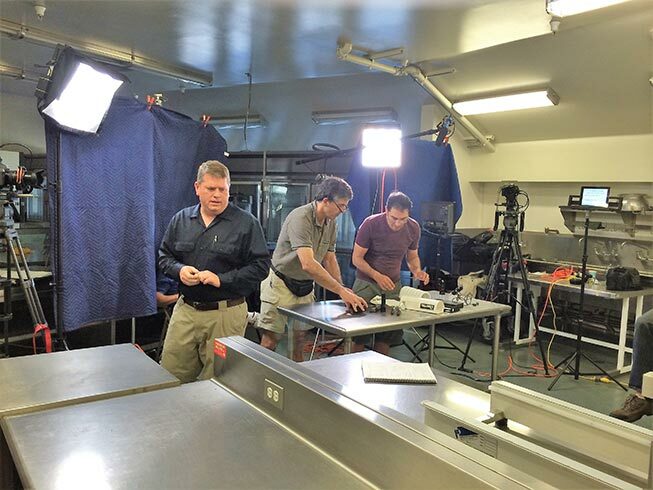 The meat-and-potatoes part of the video program is a series of interviews with experts in the pest management field. We kept these interviews scripted loosely so that they come across natural. To help us with editing, we shot each interview with two or three cameras. Andy Linda directs, Daniel Gamburg is behind camera and Stephen Laferrier is the on-camera host. Daniel Gamburg was the Director of Photography using his favorite Canon 5D camera. As director I sometimes manned the second 5D. A few special shots were done with a GoPro. Lorin Fink did an excellent job with our new iPad-based wireless TelePrompter system, even though the software is new and therefore still a little buggy. We really wanted to keep the narrator (Stephen Laferriere) moving, so walking-and-talking was the norm and for that we needed the wireless portability. Sound recording was handled by Ken Codeglia and our son Nick Linda was production assistant. Special thanks go to Producer Angela Gamburg for keeping us fed and hydrated for two weeks in the Central Valley heat. Even the interiors were sweltering because most school buildings have their ventilation systems shut down for the summer. Still, we are grateful to the school districts in Manteca and Livermore for making their schools available for this project. 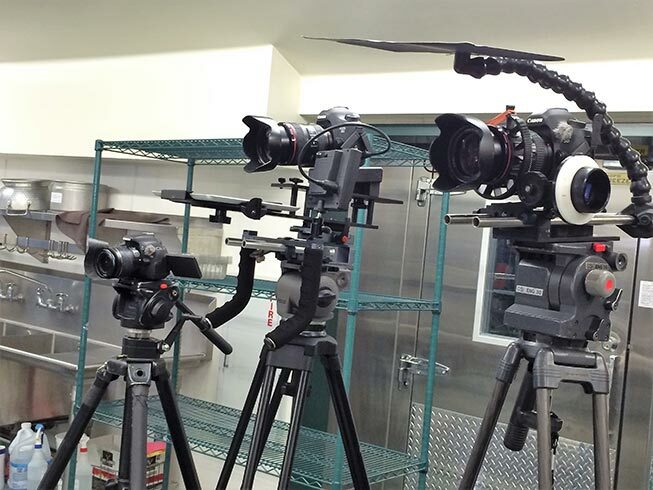 Getting props ready in a school kitchen. P.S. : The video program got finished right on schedule in December. It added up to 73 minutes total and besides being distributed on DVDs directly to school districts, it is posted online.